Want To See More Detail? Imagener Adds Pixel Resolution to Photos. Imagener is a revolutionary technology that enlarges digital images without pixelation and virtually no loss of image quality. See items, people and scenes you have never noticed before. Enlarge background items you couldn't see before for printing or viewing. GPS distance recorder and route tracker. Maps routes & accumulates mileage for tax savings. MileReg is a GPS record logging software program that uses a small device to track routes travelled and record mileage distance automatically. MileReg records previously travelled routes and accumulates mileage for tax savings, delivery tracking, driver monitoring or can be used to track routes and distance running or bicycling. Software for Time and Attendance. Cut payroll Costs While Improvingn Employee Relations. Clock Real Time™ shows employees arriving and leaving on remote computers and requires no time to total hours; it produces reports you just hand to payroll. Clock Real Time improves employee relations and eliminates wage disputes. 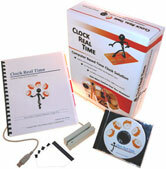 It is a complete time clock replacement. Print and assemble your own wall mural from any image you want. YottaPrint is the first program ever that lets you create beautiful wall murals with any printer - even if its not color. Take photos from your camera and put it on your wall from the floor to the ceiling. Can even be used with large format printers and plotters to create billboard size murals. Currency calculator is a currency converter program that quickly and easily calculates the value of one currency into another and remembers your currencies forever. Convert currencies with as few as two keystrokes and dozens of currencies at the same time. 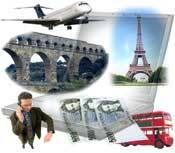 Unlimited FREE currency exchange rate updates. Visual Shield intercepts program crashes, many system freezes, "blue screens," and overall computer crashes allowing you to stabilize the offending program long enough to save your work. It can even unfreeze (THAW) hung applications when your PC is not responding to your mouse or keyboard. Visual Shield can save you hours of lost time the next time your computer hangs. Go Beyond Day Planners. Forces you to put your plans into action! Planning or writing a 'To Do' list is only half the task. You must also account for where your time actually goes. Time Registration Tracking is a program that continuously accounts for your time that you can then report on and analyze for increased productivity. Text Format Tool is a program born out of the desire to be able to quickly reformat received email which has been sent as plain text and forwarded many times, text from web pages, and old DOS text documents. All of the mentioned text sources usually consist of separate lines that make up paragraphs and often have quote's (> > > ), leading spaces, trailing spaces, multiple spacing (to justify and align). With Kneson Text Format Tool, text can be reformatted to usable text for modern applications in seconds. Click here for product guarantee.